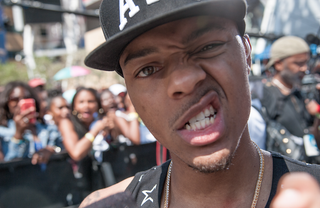 It's hard to believe the rapper and 106 & Park host formerly known as Lil Bow Wow is 28 today. Seems like just yesterday we were introduced to a precocious 13-year-old Shad Moss by way of his debut single, 2000's "Bounce With Me." Today is his birthday, and he has many reasons to celebrate. I know you can't believe it: You forgot to buy a gift. Again! But I've got you covered. Dawson's Creek box set: Bow Wow is starring alongside James Van Der Beek in the new series CSI: Cyber. This would be a good way to get to know his new co-star. The complete CSI canon on DVD: While we're on the topic of Shad's role in the new CSI franchise, this couldn't hurt to have the original show in full as reference material. Forensics for Dummies: Better safe than sorry. An Apple Watch: This gaudy wrist computer just seems like something that would be up his alley. A Snoop Dogg G Pen: A gift from Shad's very own uncle would be nice. The complete Patricia Arquette DVD collection: Mr. Wow is also sharing the CSI screen with newly crowned Oscar winner Patty Arquette, who has had a long and storied career herself, so it wouldn't be a bad idea for Shad to get a bit cozier with the Boyhood star. A role in the just-confirmed ATL sequel: Seems right up the Atlanta resident's alley. A puppy: As far as I know, Bow Wow is not a dog owner. That just feels wrong, considering his stage name and all. Also, the Today Show recently got a labrador puppy, and it's made me pay about 100 percent more attention to the Today Show. Just saying! An Edible Arrangement: When in doubt! A course on computer programming: In CSI: Cyber, Shad plays FBI Special Agent Brody Nelson, a former blackhat hacker, and it's important to inject some semblance of reality in this piece of television gold. Teach Bow Weezy to code, is what I'm saying. Classes at Barry's Bootcamp: Shad and Love & Hip Hop star Erica Mena are getting married soon, which means it's time to get that bod wedding-ready, man. A VitaMix: Again with the whole wedding thing. Confirmation of a Carmen: A Hip Hopera reboot: Beyoncé stars across Mekhi Phiefer in this 2001 MTV musical; Bow Wow played Jermaine Dupri's cellmate. I think it's nice to give people a gift that you, yourself, will enjoy, and I have a strong vested interest in seeing a remake of this important piece of pop culture. A Pisces-themed sweatshirt: With a strong Rihanna crossover. What's not to like? A Mod Podged collage of pics from the days when Bow Wow dated Ciara: Do you remember when Bow Wow dated Ciara? I do! People don't forget! Although, I would assume they both would like to mind zap away their Ed Hardy-heavy sartorial choices from that era. In any case, if you've dated someone like Cici, that's not something you'd want to not commemorate. Krav Maga classes: I mean, he's about to marry into a whole VH1 reality-show thing, and I have seen enough reunion specials to know what dangerous territory that can be. Dance classes: Again on the wedding thing. You do NOT want to get shown up on the dance floor at your own nuptials. A pair of tickets to the rumored Kanye/Rihanna tour this summer: And! Shad, if your new bride is out of town and you need someone to go with, my schedule is free.